Perhaps the most efficient way Human Resource Managers can shield themselves from liability when faced with discrimination allegations is to be able to provide sufficient proof supporting the legitimacy of the employment decision being challenged with documentation. While this may sound pretty obvious, in majority of the cases, the personnel file for the employee in question falls short in showing a record of unexcused absenteeism or a history of poor performance that led to the termination of the contract. This can, in turn, lead to a cut-throat battle regarding defending against claims that age, gender, religion, race or disability was the primary reason for the dismissal. We are now going to delve into how HR managers can use a paper trail for discipline as well as documentation to avoid this. What are some of the things that should be written down? If it comes to your attention that a particular employee has started developing a habit of submitting work that’s below par, slacking on the job, coming to work late or handing in assignments past the deadline, be sure to jot down the problem and bring this to the employee’s attention. It’s extremely important to document the fact that you brought the problem to the employee’s attention as this will detract from his or her credibility should they later purport that the termination is not work related as he or she was never notified about deficient work. Anytime you observe or receive a report concerning any of the above, make sure you write it down. If the incident, for example, is the violation of a particular company policy, refer to the provision in your documentation. Though the dispute may seem petty, a record of repeat offenses may show a behavioral pattern that may justify taking an adverse action. Accurate attendance records of your employees are imperative. These come in especially handy when faced with a lawsuit by an employee whose absenteeism or lateness spurred a termination of the contract or a disciplinary action. Written evidence is much more persuasive compared to an HR manager testifying that the particular employee mostly came to work late or was absent a lot. 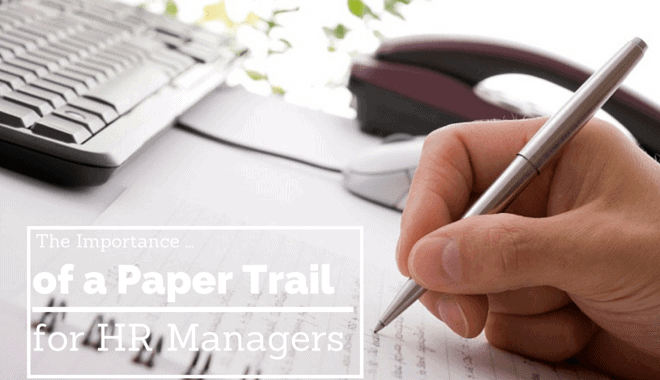 The other important aspect of a paper trail for HR managers is employee evaluations. Though it’s not a requirement by law, it’s a great way of ensuring that your team of employees is operating at peak capacity to improve your odds of meeting the company’s goals and objectives. However, to avoid wrongful discharge lawsuits or your ability to defend discrimination charges, you should keep the following guidelines in mind. Don’t feel the need to inflate an employee’s performance or be too generous. In the same light, do not cluster all your staff in the group of ‘meets all company’s expectations’. Though it may be difficult to discuss with employees about their poor performance, think of how challenging it will be to justify in a court of law why you terminated an employee for poor performance when all the performance records show that you rated him or her as meeting all the company’s expectations. While it may be uncomfortable to discuss performance issues with employees, failure to address this in a performance evaluation beats the logic of the entire review process. It’s critical that you don’t let your personal feelings towards an individual employee come in between your performance evaluation. An employee’s performance should be measured against a particular performance benchmark that is measurable. However, personality issues that spill over to performance should be noted and brought the employee’s attention. Seldom is a discrimination case supported by valid evidence of intent. Rather, when there’s no smoking gun, so to say, such cases are left in the hands of circumstantial evidence. The jury likes tangible proof in the form of a paper trail. Make it a habit to document all employees’ issues in the workplace and you will always have a paper trail that speaks for itself and in your favor.